I'm sure you are all familiar with those ridiculous online quizzes, 'If you were a tree, what kind of tree would you be?' And while I have no idea/don't care what kind of tree I am, I have a pretty good idea what kind of party sums up my personality. 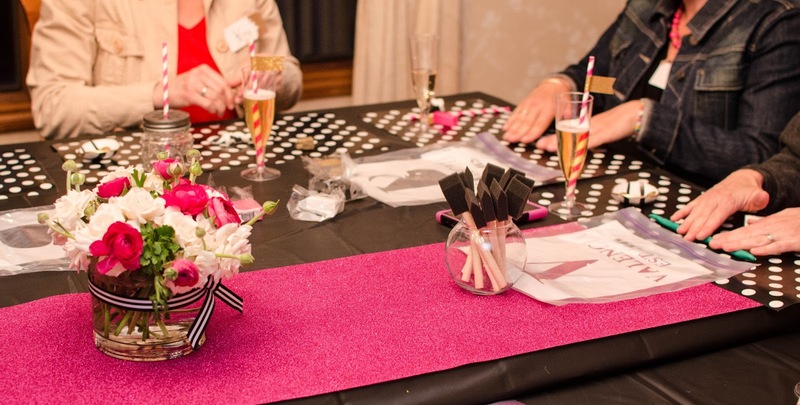 You start with an awesome group of ladies, add Kate Spade inspired decorations, dessert, and bubbly, and top it off with a little Pinterest crafting. 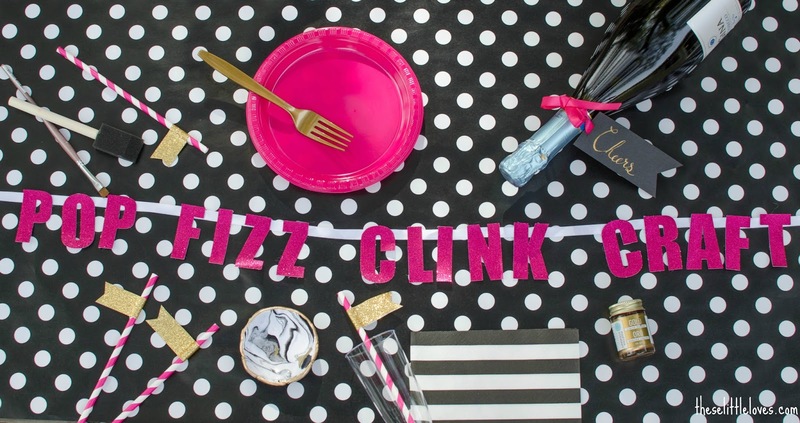 I call this party 'Pop Fizz Clink Craft'. And while I hope I am a little more complex in real life, I'm entirely comfortable with this soiree summing up my party personality. This party started out as a vague idea to get the ladies in my mom's group together (sans kids) and turned into something a little more elaborate. Sometimes my inner party planner gets a little over excited. Someone really needs to keep her under control. This was my chance to spoil my mom friends (and myself! ), and I ran with it. 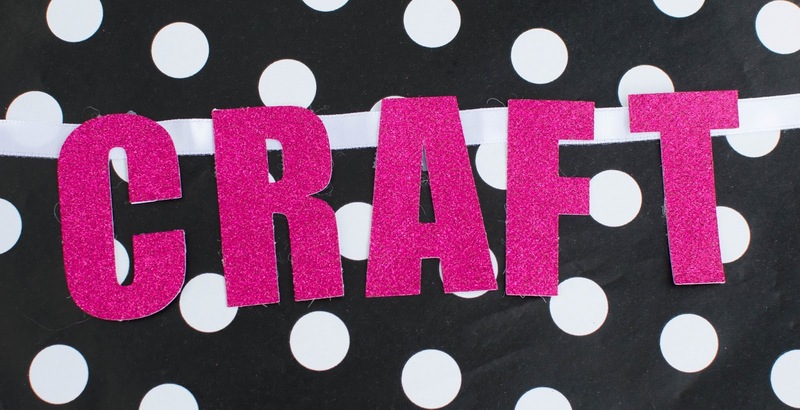 Think 'fancy' and 'crafting' don't go together? Keep reading. I will change your mind. Let's start with the 'Pop, Fizz, Clink' part of the evening. 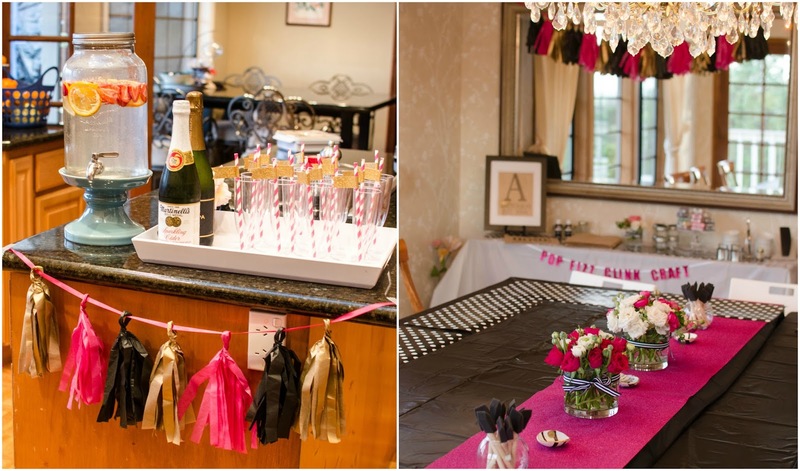 The color scheme for the party was black, hot pink, and gold. My love of Kate Spade came through not only in the colors, but also in the polka dots, stripes, and the touches of glitter. And did I mention the champagne? A perfect excuse to break out my new gold calligraphy ink for some custom 'cheers' drink tags. While I had my calligraphy pen out, I made name tags out of cardstock rectangles and painted the edges with gold gilding. 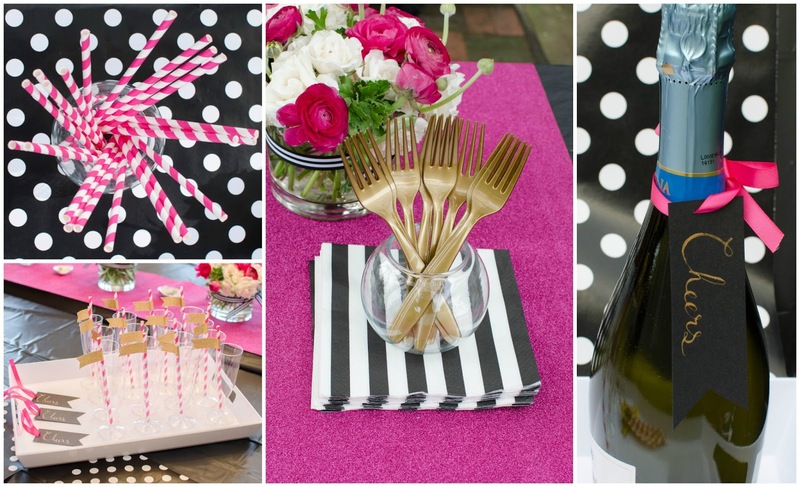 Hot pink plates, gold forks, striped napkins, hot pink straws (with gold glitter washi flags), and plastic champagne glasses complimented the theme perfectly. This is the first party I have ever thrown at a location sight unseen, which I admit made me a bit nervous. I knew the location was going to be lovely, I just wasn't quite sure what decorations to bring. In the end, I stuck to a few tried and true options that served me well. I made several tissue paper tassel garlands as an inexpensive and versatile way to add a little festivity to any party setting. 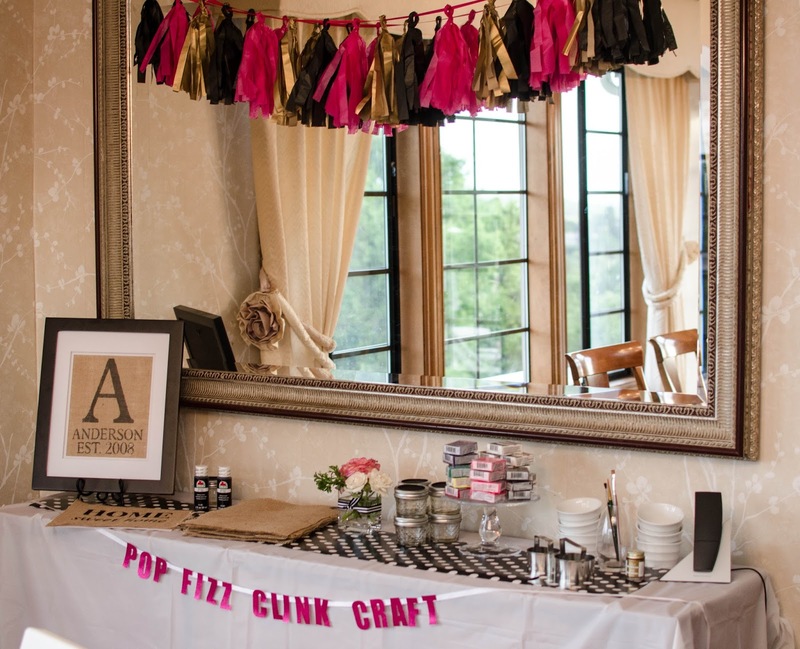 The tissue garlands and one pink glitter 'Pop Fizz Clink Craft' garland served as the general decorations, while I focused the rest of the decorating on the main crafting table. 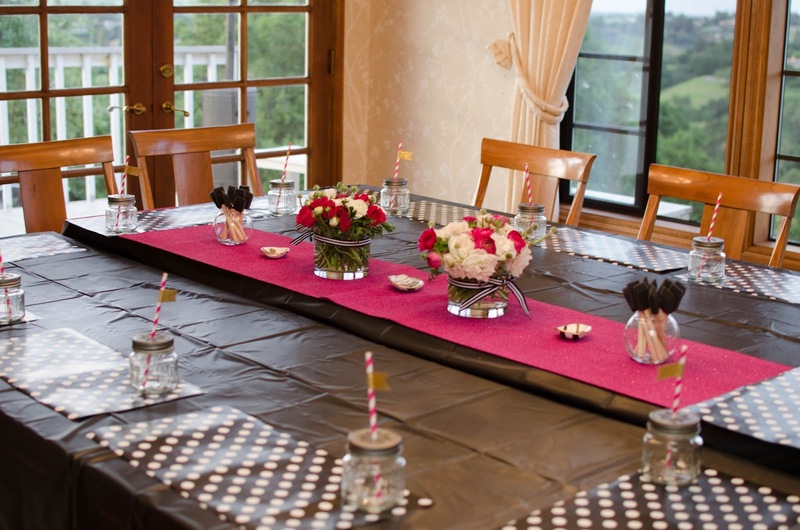 Keeping the activities of the party in mind, I covered and decorated the table with disposable items. In other words, everything could get messy! The polka dot placemats were cut from a wrapping paper roll (from the dollar section at Michaels! 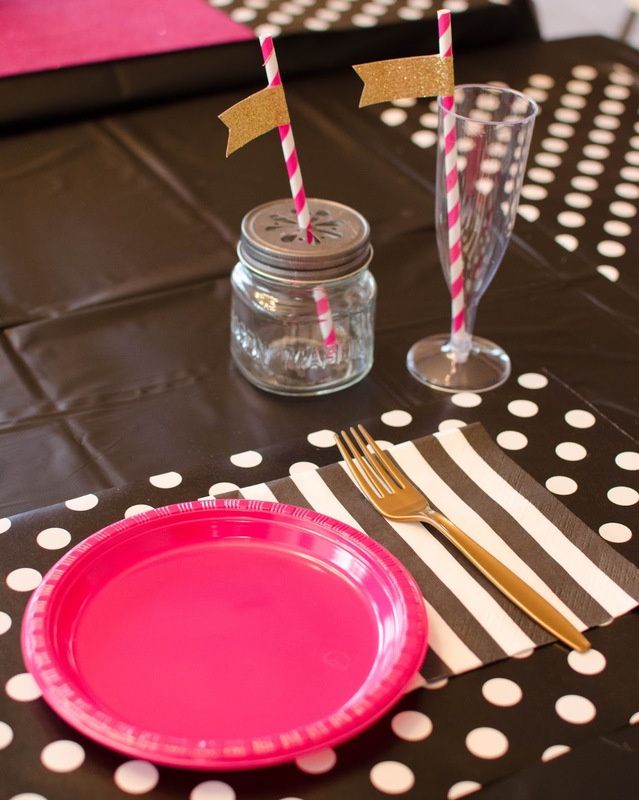 ), the black tablecloths were plastic, and hot pink glitter gift wrap served as the table runner. 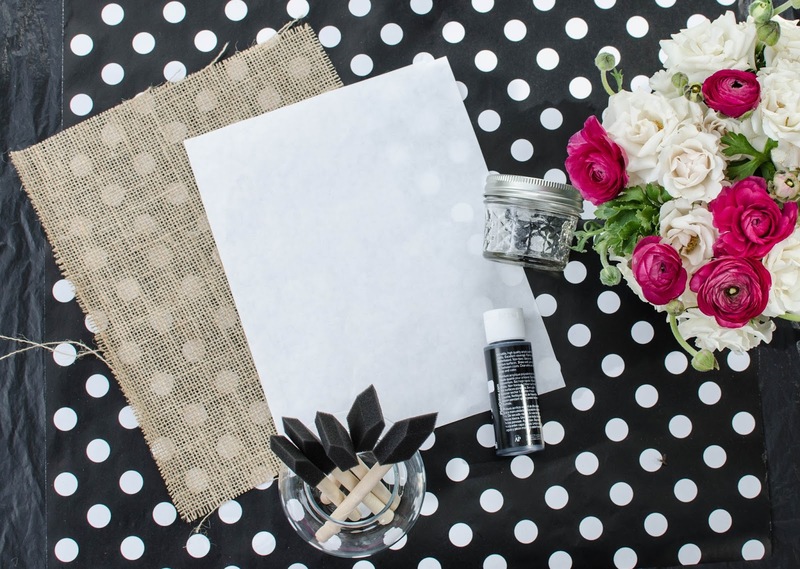 (As a courtesy to our hostess, I sprayed the table runner ahead of time with a clear coat to prevent glitter shedding. I hear you can also use hairspray.) Clay ring dishes along the length of the table gave an example of the completed project and also provided a place to hold rings if removed for crafting. You can never go wrong with fresh flowers. I originally had my heart set on finding white anemones for the arrangements, but, alas, the stores were sold out. Plan B surprised me, however. 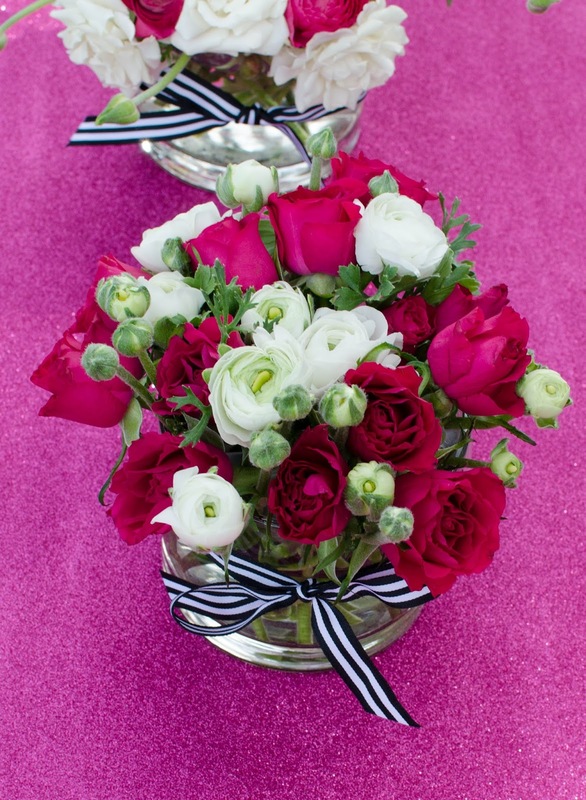 I put together two simple arrangements in hot pink and white using ranunculus and small roses. 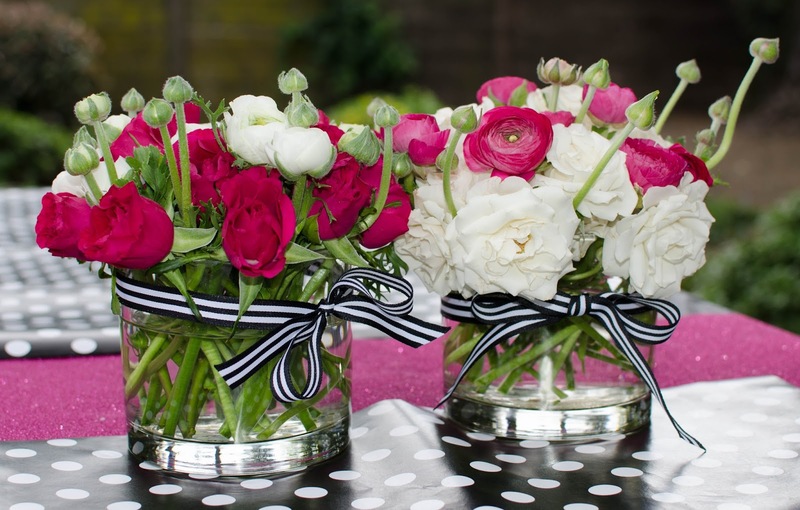 Black and white striped ribbon tied them in perfectly to the decorations. I really love how these beauties turned out and they lasted me for almost two weeks at home after the party. As I am sure you can tell from the photos, the location of this party turned out to be spectacular. 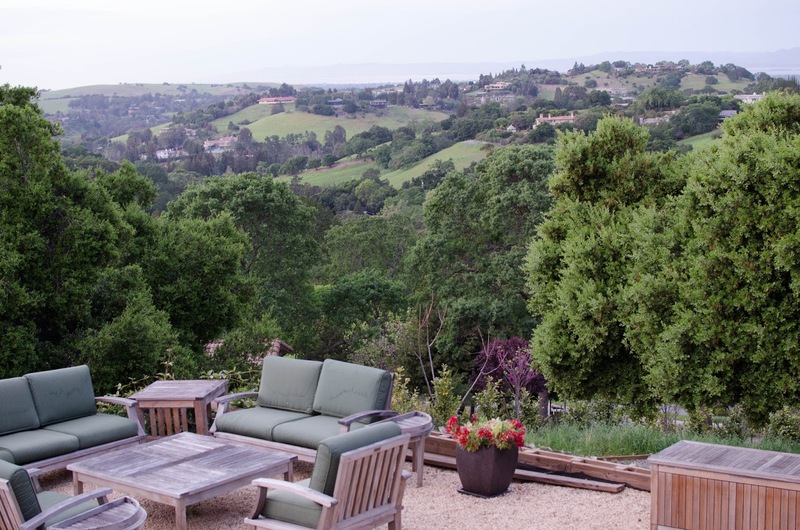 Can you believe this view? I get more relaxed just looking at this picture. With more than a few bakers in the group, we turned the event into a dessert potluck. This eased the burden on the hostesses and we had plenty of goodies to share. After a little mingling, dessert, and champagne, we moved to the second part of the evening....getting crafty. 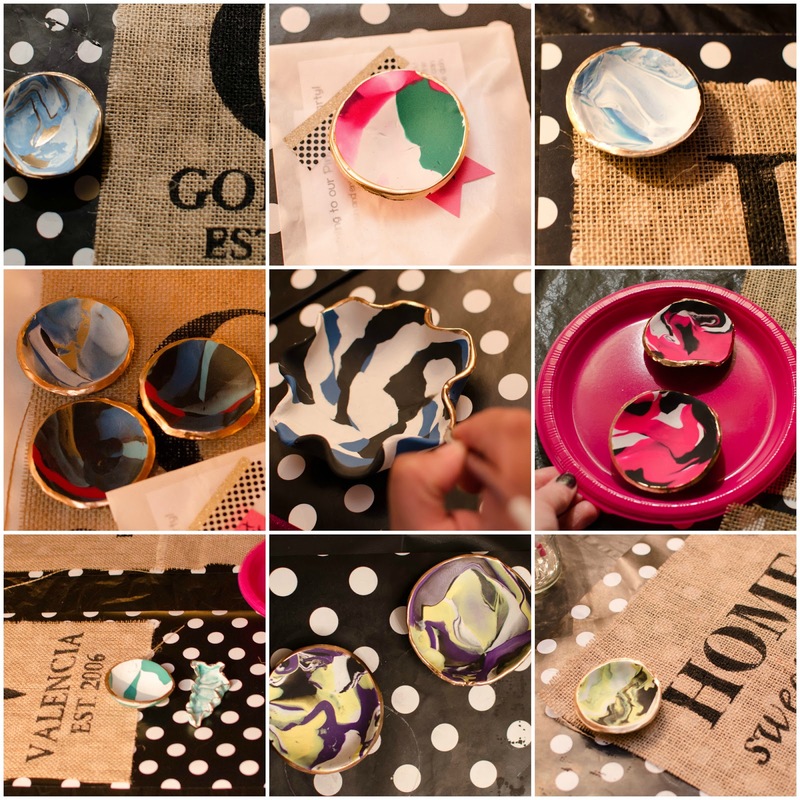 We had two craft options available: painted burlap monogram art and a marbled clay ring dish. Each was pre-prepped to give the guests a chance to do both within the time limits of the party, if desired. Cake plates, vases, flowers, and more tissue tassel garlands kept the crafting supplies looking festive on the buffet table. Little touches that make all the difference. 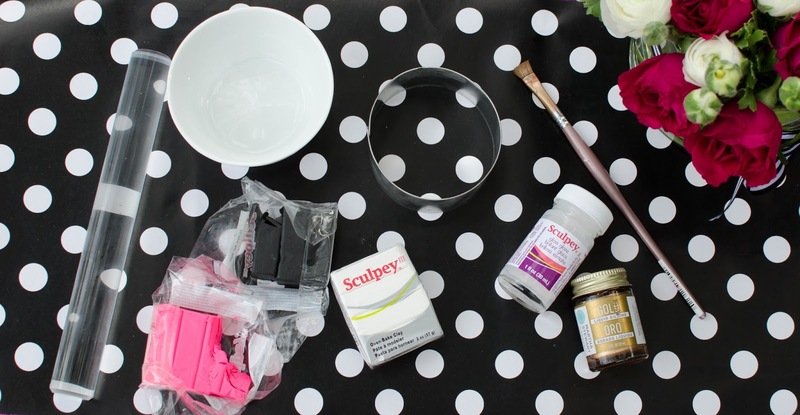 Supplies needed for the ring dish: small ramekin, rolling pin, oven-bake clay, cookie cutter, gold gilding, paint brush, and gloss glaze. 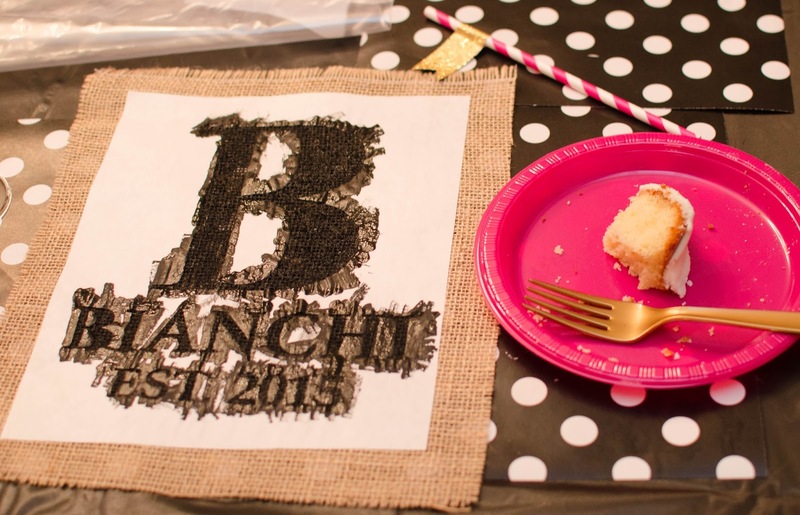 Supplies needed for the burlap monogram: pre-cut freezer paper stencil, burlap, black paint, paint brush, jar, iron and ironing board. To account for the baking time, the ladies started with forming the marbled clay ring dishes. You can find the full directions for these ring dishes here. I love how each bowl is completely unique. And the gilded edges keep them from looking anything remotely like a kindergarten project. 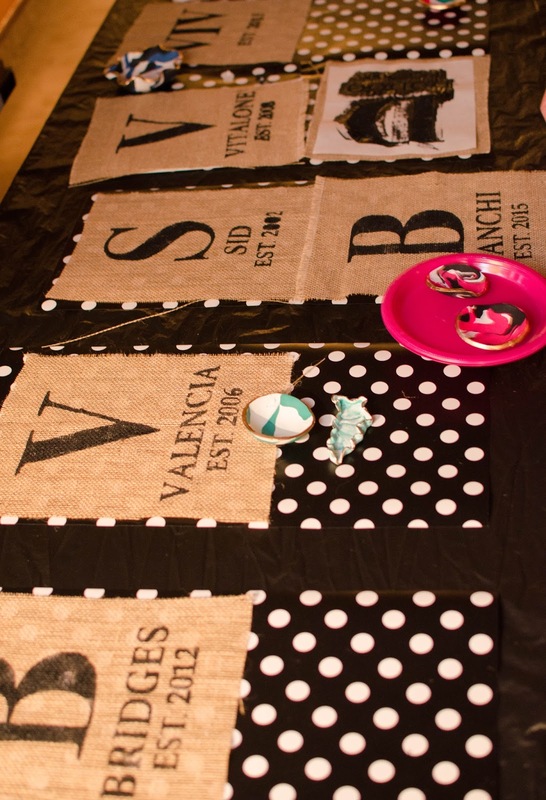 You can find my original instructions for completing the burlap art here. However, this time I tried a new method for making stencils. It was awesome! I used my Silhouette Cameo to cut the stencils out of freezer paper (shiny side down). Making sure to keep track of all the little inner pieces of the letters, I transferred each stencil to its own ziplock bag to hand out at the party. After the parts of the stencil are placed on the burlap (shiny side down), ironing the stencil makes the freezer paper gently stick to the burlap. No taping, no shifting. After painting, the freezer paper easily peels right off. Brilliant. A big shout out to one of my crafting genius friends, Rachel, who introduced me to this idea. Guests placed completed crafts on a separate drying table, allowing more room for dessert and multiple projects on the main crafting table. Our chosen projects required a few finishing touches at home. I sent everyone home with all the bits and pieces needed to finalize their crafts: take home instructions, gloss glaze in small glass vials, and a coupon to a craft store to purchase a frame for the burlap art. You will also want to consider how the projects will be transported home. I had sheets of freezer paper on hand to protect crafts and cars for transport home. 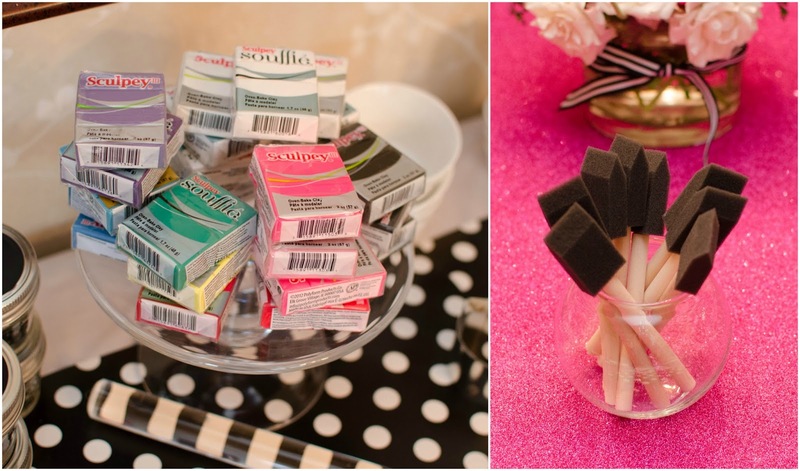 Now that I have my first pinterest party under my belt, I've been stockpiling other project ideas for future parties! You can check them out on my pinterest board here. I hope this inspires you to get your ladies together for some crafting fun, or maybe just dessert. Either way, I'd love to see what you come up with. Tag me on instagram (@theselittleloves) or find me on Facebook. Like my party supply choices? Find all the details below! Don't hesitate to ask if I've forgotten anything. Thanks! This was an incredibly fun party to throw. I actually just hosted a second pinterest party a few weeks ago and will post a follow up soon!